XENIA — An inmate was captured around 10 a.m. July 26 after escaping from the Greene County Jail. 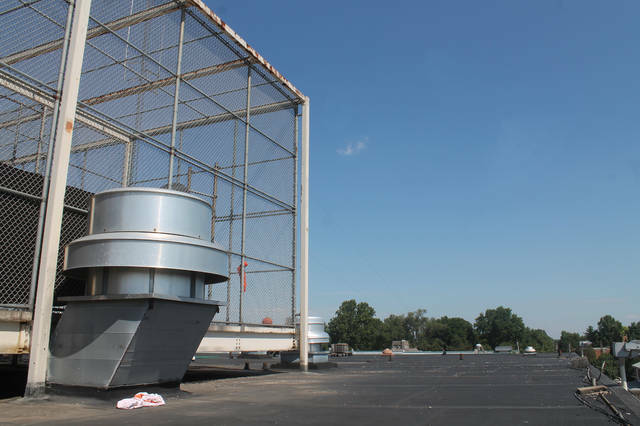 David Suarez, 33, was in the outdoor recreation area on the roof of the jail when he allegedly pulled up the bottom of the fence, broke its heavy-duty straps, crawled under the fencing and ran down the fire escape, according to Greene County Sheriff Gene Fischer. He left his shirt, and possibly his pants, near the fence. Police said Suarez took off running south of the building, stole a bike, and headed north on the bike path. Coroner’s Office investigators spotted Suarez close to McDonalds on North Detroit Street. 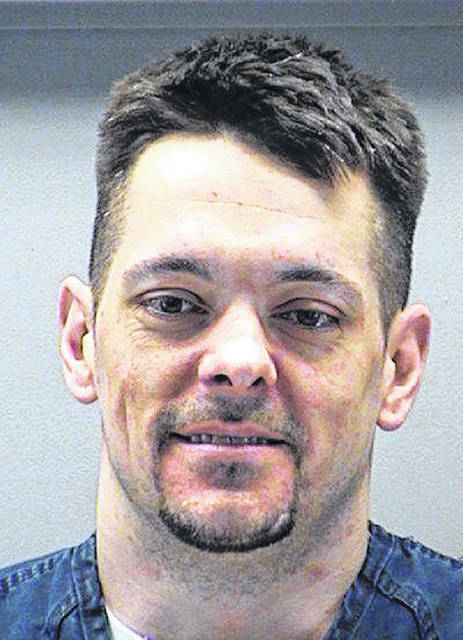 Sheriff’s deputies, Ohio State Highway Patrol, Xenia Police Department and Greene County Parks & Trails rangers searched for the man and took him into custody a little after 10 a.m.
Fischer said additional charges will be filed because of the escape. He also said after looking at video surveillance, he believes other inmates were involved who used distraction techniques. He said they may be charged as well. Fischer said the recreation area will be shut down temporarily. “We have to come up with a better solution now that that has been compromised. I’ll spend some time today with the head of maintenance from the county and see what we can do. 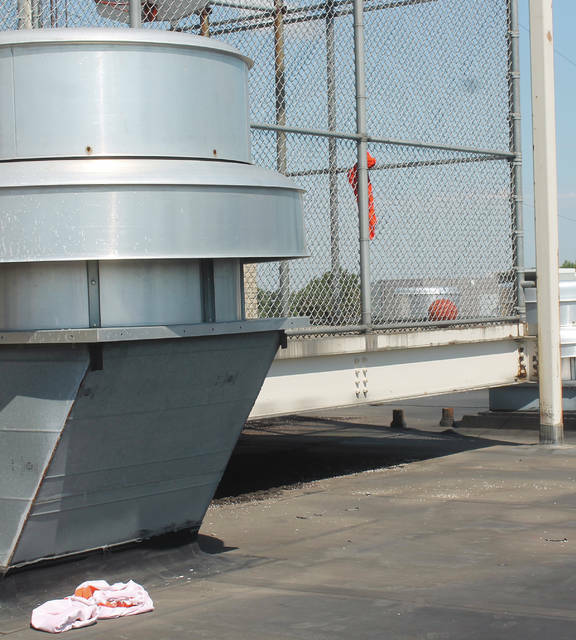 We may have to cable that instead of using the straps,” he said. Fischer said the escape is an example of why a new jail is needed to replace the 50-year-old facility. The jail may be a few years away from construction but planning is underway. Inmate Bryan Goney escaped from the jail in July 2017, falling from a third-story isolation cell window. Fischer remembered only one other escape in his time as sheriff. Suarez is currently being held on a $600,000 bond. https://www.fairborndailyherald.com/wp-content/uploads/sites/50/2018/07/web1_CloseUp-1.jpgSuarez’s shirt hangs from the fence where he escaped. The clothing article to the left appears to be a pair of pants. 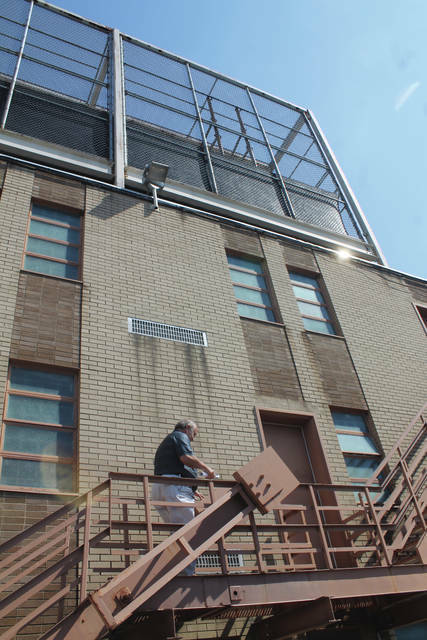 https://www.fairborndailyherald.com/wp-content/uploads/sites/50/2018/07/web1_FireEscape-1.jpgFischer said Suarez used the fire escape, then stole a bicycle. 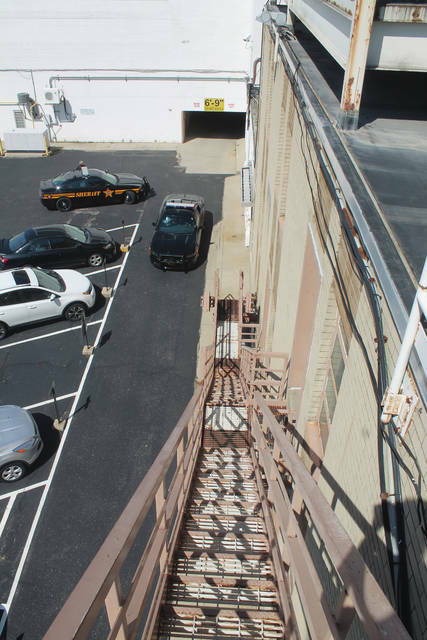 https://www.fairborndailyherald.com/wp-content/uploads/sites/50/2018/07/web1_OutdoorArea-1.jpgAnna Bolton | Greene County News Sheriff Gene Fischer said inmate David Suarez pulled up the fencing around the outdoor recreation area, crawled underneath and ran down the fire escape. https://www.fairborndailyherald.com/wp-content/uploads/sites/50/2018/07/web1_Sheriff-1.jpgFischer said Suarez used the fire escape, then stole a bicycle.